THE LAND OF THE GIANTS? — The Spanish conquistadors stood in awe of the Timucua physique. From a distance, the powerfully built Indian men seemed like giants, standing at least three or four inches taller than most of the Spanish. The native women could have also looked down on European females. In actuality, skeletal remains show that Timucua six-footers were rare. Height-wise, they would be comparable to some high school basketball teams today. These Indians seemed more lofty back then, though. 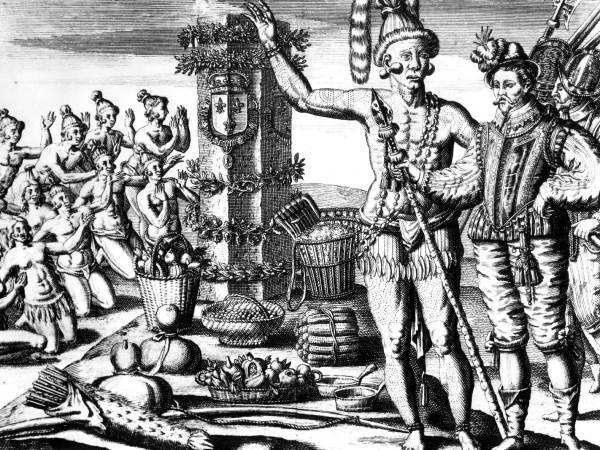 The Spanish were shorter than Europeans and Americans are today, partly because their food was not as nutritious. Some Timucua men also wore their long hair in a bun on top of their heads. This made them look even taller. PHYSICALLY FIT — According to a French explorer, the Timucua women proved athletic, just like the men. The women could climb a tall tree, and they could swim across a wide river while holding a baby above the water with one hand. 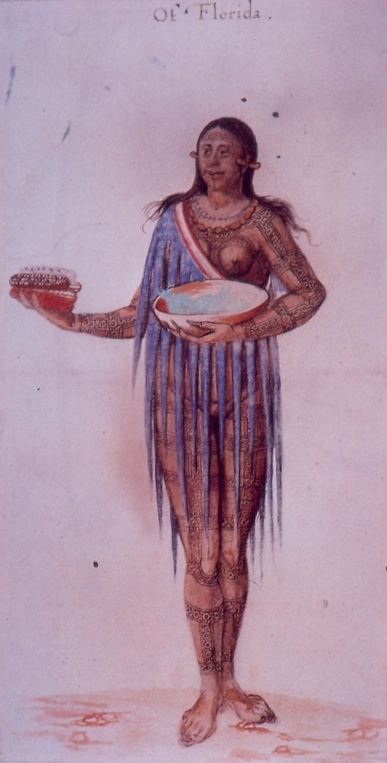 This lovely Timucua lady was drawn by a European during the 1590s. From head to foot, she’s covered with tattoos. They probably told everyone at a glance that she belonged to a high social and political class. NATIVE APPEARANCES — Both men and women in Timucua society had light brown or dark skin. Its appearance came from exposure to the sun and from its anointment with oil for ceremonies. Their hair was black or very dark brown. Males wore deerskin loincloths. These were painted yellow, brownish yellow, or red and black. Females sometimes dressed in deerskins, but their attire usually consisted of elaborate garments made from Spanish moss. They probably boiled or smoked the moss to kill any bugs in it. Both sexes adorned themselves with ornaments. These were often created from shells or other materials, such as copper. Jewelry included beads, pendants, bracelets, and breastplates. Both men and women also featured tattoos. They stabbed tiny holes into the skin in elaborate patterns using shark’s teeth or bone needles, and then rubbed in wood ashes mixed with berry juice and other pigments to color the design. Tattooing sometimes made the Timucua ill, but the marks undoubtedly contributed to their impressive appearance. Older children would begin to get body decorations when they started to assume adult responsibilities. Strength and bravery could also earn someone tattoos. In addition, tattoos showed the clan (family) to which an individual belonged, and they indicated a person’s role in society. Not surprisingly, higher-ranking people boasted the most body decorations. A DIFFERENT LOOK — Some Timucua men painted their faces and fluffed out their hair. Why did they do this? If a man didn’t want to become a warrior, he had to assume the role of a woman. According to the French, the Timucua society contained a large number of berdaches, males who functioned as females. Among the Timucua, the berdaches received the most demanding and unpleasant responsibilities. These included hauling provisions for men going to war, tending to people with contagious diseases, and preparing dead bodies for burial. Timucua berdaches painted their faces, typically wore at least some female attire, and could be distinguished from both men and women by the color of the feathers they wore in their hair. Berdaches functioned in other Native American societies, too. However, they usually possessed a higher social, economic, and/or spiritual status than berdaches in Timucua cultures. In this country there are numerous hermaphrodites, a mixture of both sexes. They are considered odious by the Indians, but as they are robust and strong they are used to carry loads instead of beasts of burden. When the kings set out to war, it is the hermaphrodites who transport the supplies. They place the Indians, dead from either wounds or sickness, on a stretcher made of two stout poles covered with a mat of woven thin canes. The head rests on a fur; a second fur is wound around the stomach; a third around the hips; a fourth is placed around the calves. (I did not ask the reason for this custom, but I suppose it is for show, for sometimes they do not do all this and simply bind one leg.) Next they take belts of leather, about three or four fingers wide and fix them at both ends of the poles and put them on their heads, which are very hard; then they carry their dead to the place of burial. Persons with infectious diseases are carried to places reserved for them on the shoulders of the hermaphrodites who supply them with food until they are well again. All transcriptions are taken from Discovering the New World, Based on the Works of Theodore de Bry, edited by Michael Alexander (New York: Harper & Row, 1976).